Stylish, Almost 5' Long Tabletop Is The Top Part Of A Lorell Prominence Infinite Length Conference Table. Attach An Adder Section (Sold Separately) To Expand The Conference Table Or Just A Matching Modesty Panel, Straight End Base And/Or Curved Base (All Sold Separately) To Complete It. Espresso Melamine Laminate Offers A Durable Surface With A 3mm Edgebanding To Last For Years Of Meetings. High-Pressure Laminate Is Stain-Resistant, Spill-Resistant And Scratch-Resistant. Heavy-Duty, 2" Thick Tabletop Is Made With Melamine-Faced Chipboard And Medium-Density Fiberboard With A 50mm Thick Honeycomb Frame. Use The 3-1/4" Grommet For Easy Cord Management. Weight Capacity Is 80 Lb. (36.5 Kg). To Support This Tabletop, Use Two Bases. If You Expand With Adder Sections, Remember That All Tables Approximately 12' Or Longer Require Curved Bases At Both Ends For Stability.. Stylish, Almost 5' Long Tabletop Is The Top Part Of A Lorell Prominence Infinite Length Conference Table. Attach An Adder Section (Sold Separately) To Expand The Conference Table Or Just A Matching Modesty Panel, Straight End Base And/Or Curved Base (All Sold Separately) To Complete It. Espresso Melamine Laminate Offers A Durable Surface With A 3mm Edgebanding To Last For Years Of Meetings. High-Pressure Laminate Is Stain-Resistant, Spill-Resistant And Scratch-Resistant. 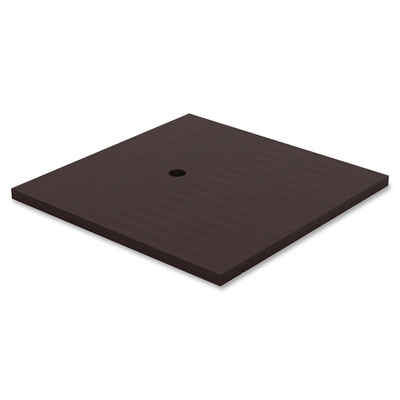 Heavy-Duty, 2" Thick Tabletop Is Made With Melamine-Faced Chipboard And Medium-Density Fiberboard With A 50mm Thick Honeycomb Frame. Use The 3-1/4" Grommet For Easy Cord Management. Weight Capacity Is 80 Lb. (36.5 Kg). To Support This Tabletop, Use Two Bases. If You Expand With Adder Sections, Remember That All Tables Approximately 12' Or Longer Require Curved Bases At Both Ends For Stability.